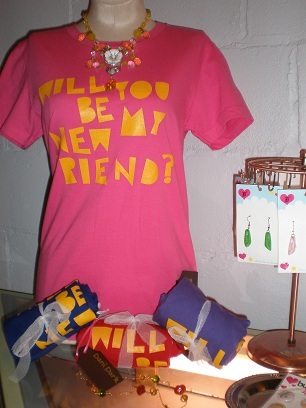 “Will you be my new friend?” was the theme received from the You & Me Boutique. Within 30 seconds of entering the door Tim welcomed us with a lively approach and smile. The atmosphere was great; there was a live pianist and lots of chatty people. You & Me were featuring local designers: Samantha R. Crossland of Blasphemina’s Closet, Samuel James for Skinned, Missie Kittok of Affair Nights Longing, and Sina Y. [Design] Collection. You could really tell the staff enjoyed being at the You & Me Store. It was nice to see the t-shirts we wandered past matched their overall attitude. Tim came up to us and gave us a tour of the store. He and his brother, Thom Navarro along with friends Jim and Katy Vereide own the store and opened it together about two years ago. 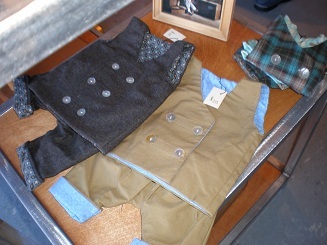 They do everything from in-store tailoring to custom design and jewelry. The store capitalizes on the custom shopping experience: there are work stations set up throughout the store, providing each customer with a role in the creative process of their garment. They’re not shy about their mission, you can find it right on their website: “We carry no sizes, if it fits it’s yours, if it doesn’t we can either alter it to fit or design something custom for you.” This boutique may not carry sizes, but they do carry something more important: an aim-to-please attitude and willingness to go the extra mile. Not only are the folks at You & Me experts at tailoring and design, but they also make a killer drink! Their signature drink is called “The Button.” Light and refreshing just like their creators, it is concocted of mango, orange and pineapple juice, vodka and seltzer. We were immediately drawn to the most adorable and trendy accessory everyone should try this fall, a faux-collar necklace. 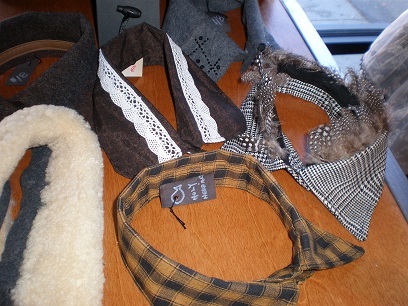 These beauties come in all patterns and textures for you to find the one that fits your personal style best; from an argyle number with feather accents, to vintage-inspired with lace trimming, and shearling. Put the argyle collar with fur detailing on top of a black long sleeve top with a sheer chest and long sleeves tucked into a gray pencil skirt with black lace up booties. Another way to try the faux-collar look would be to pair the gray beaded collar with a green, chunky-knit scoopneck sweater casually tucked into an a-line black leather above-the-knee skirt. With so many styling possibilities, we definitely need to go back and buy one…or all of them! Metallic is overtaking the runways. This year-round trend makes these pieces easy to transition from Fall to Spring. 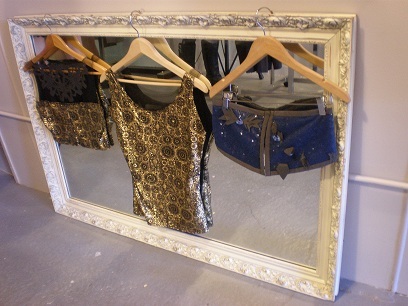 The first cropped top has a gold and black circular print pattern for the bust and a cut out lace chest detailing. 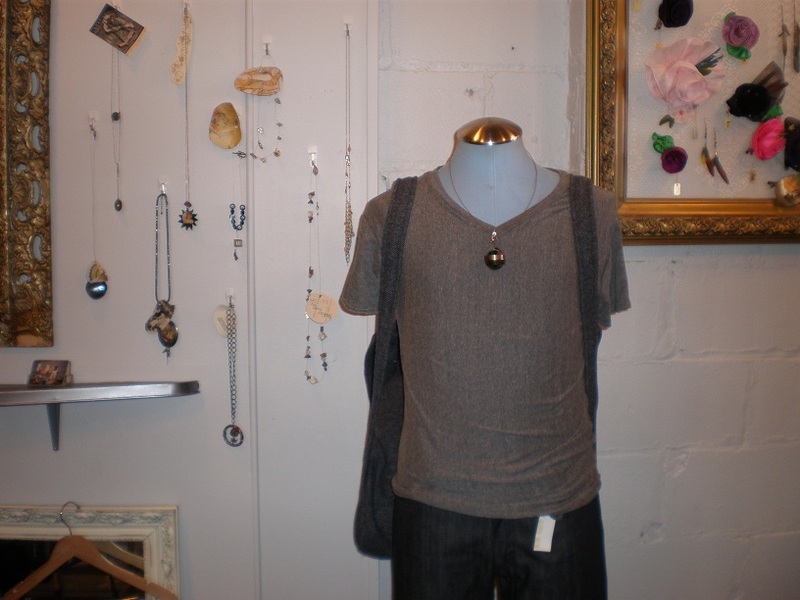 You do not need to rely on jewelry to make a statement when wearing this top! Match it up with a pair of black skinnies, a blazer and a pair of booties and you’re ready to go out for a night on the town. The middle shell would be perfect paired with a wide leg pant and sky high stilettos. The leaf appliqué makes the blue sequin bandeau a fun way to resist the cold weather by baring just a sliver of tummy with a high-waisted bottom and jacket. Either way you dress it, adding metallic is an effortless way to make any size, shape, color, or age stand out in any crowd. It’s hard to believe that we have never happened across this little gem in Uptown, tucked away between the Red Dragon and Clown Glass; but I am very happy we came to check it out, and look forward to many more visits in the future! A big thanks again to Tim & Thom Navarro and also Jim & Katy Vereide for their incredibly warm and genuine hospitality. beautiful for not only that someone special, but also to capture your own inner beauty. Empreinte from France, Prima Donna from Belgium, and others. 5:30 to 6:00pm Light refreshments, nibbles and live Jazz by Wenso Ashby. 6:00 to 7:00pm Fall/Winter Lingerie Fashion show styled with jewelry from Realia by Jen. Bar with proof of attendance at event. The evening will have a limited guest list, RSVP required at http://labratique.eventbrite.com/. cup size D and up.